This is indeed a unique piece of crafting. 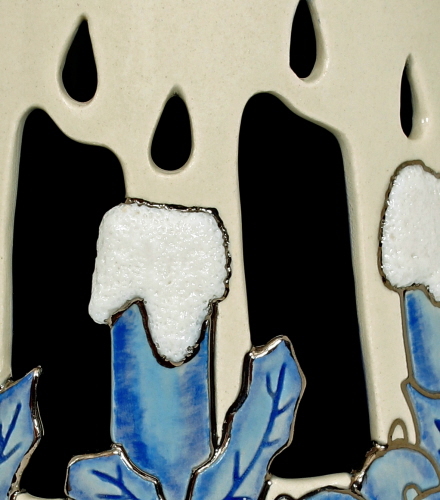 The candles and "flames" have been hand cut into the porcelain to create the illusion of burning candles. When a lighted or battery-operated "candle" is placed inside, the dark navy-blue to near black gloss interior finish gives of a radiant glow. 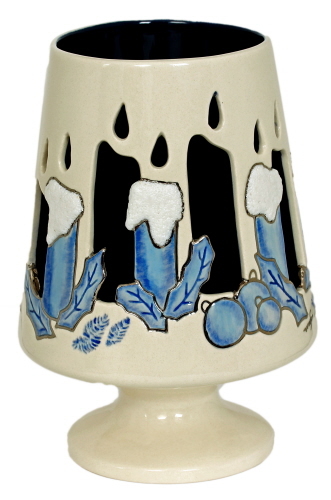 The "melted wax" of the candles is raised in a pitted design to further give the illusion of melting wax. The candles themselves are hand-etched into the luminary to give a more "3D" look and feel to the piece, accented with a silver inlay border. 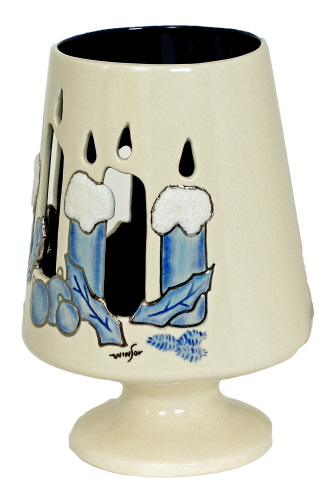 The luminary's base color is of gloss bone-white. This piece measures about 9" tall, and about 16" at the top circumference tapering to about 20" in circumference near the pedestal. The base is 4" in diameter.